The Obama administration's auto industry task force failed to fully consider how many jobs would be lost at car dealerships when it rushed General Motors and Chrysler into bankruptcy last year, a report issued Sunday says. The Treasury Department's task force "made a series of decisions that may have substantially contributed to the accelerated shuttering of thousands of small businesses and thereby potentially adding tens of thousands of workers to the already lengthy unemployment rolls," said an audit prepared by the inspector general of the Troubled Asset Relief Program. "Job losses at terminated dealerships were not a substantial factor" in Treasury's consideration of dealership closings, the report said. Though it isn't certain how many jobs will be lost at each shuttered dealership, "it is clear that tens of thousands of dealership jobs were immediately put in jeopardy" as a result of actions by Chrysler and GM, it said. The number of dealerships targeted for closure hasn't been released, but original plans targeted 2,243 franchises -- 789 from Chrysler and 1,454 from GM. Investigators also said there was disagreement among Obama officials about "where, and how quickly, the cuts should have been made." The report was also critical of Treasury for failing to consider whether the dealer closings would result in any savings to GM and Chrysler. Closures "Avoided a Potentially Catastrophic Collapse"
For its part, the Obama administration objected to the report's findings and said the audit focused solely on one element of a painful restructuring, the Associated Press reported. Without the shared sacrifices of workers, dealers, retirees, suppliers and creditors, officials said, the companies may not have rebounded. "The administration's actions "not only avoided a potentially catastrophic collapse and brought needed stability to the entire auto industry, but they also saved hundreds of thousands of American jobs and gave GM and Chrysler a chance to re-emerge as viable, competitive American businesses," said Herbert M. Allison Jr., Treasury's assistant secretary for financial stability. Owners of dealerships targeted for closure have fought back, lobbying lawmakers hard for an arbitration process to appeal the closings. In response, Congress passed legislation last December mandating the arbitration. Earlier this year, GM said it would reinstate 660 dealerships it had threatened to close, reducing the number of appeals. 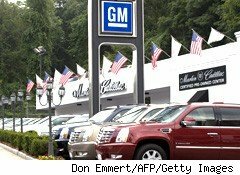 GM is expected to wind up with some 5,000 dealers, down from about 6,000 last year prior to its bankruptcy. Chrysler has agreed to reinstate some 80 dealers, AP reported. In a written statement, GM said the events depicted in the report "have since been overtaken by a new GM and a stronger dealer network to match," adding that a year later, after exiting bankruptcy, the company is showing progress. Chrysler, now run by Italy's Fiat, declined to comment on the inspector general's report, AP said.